KIEFER Ravena scored 23 points including 12 in a huge fourth-quarter run to lead Ateneo to a come-from-behind 68-64 overtime victory over Far Eastern University and the top seeding in the UAAP Season 77 men’s basketball tournament at the Araneta Coliseum. Ravena led a 17-2 finishing run in regulation including two clutch free throws with 20.3 seconds left that sent the game into overtime, before a 7-0 start to the extra period completed the Blue Eagles' stirring comeback from 19 points down. After failing to make it to the postseason last year to end a run of five successive league championships, the Blue Eagles returned to the Final Four in a big way with an 11-3 win-loss record and a twice-to-beat advantage as the top-seeded team. It was a sorry loss for Far Eastern University (10-4), which was forced into a playoff for the No. 2 spot against the winner of the De La Salle-National University match in the second game. FEU has not won since head coach Nash Racela returned to the team after joining Gilas Pilipinas in Spain for the Fiba World Cup. FEU led 45-26 after outscoring Ateneo, 20-8, in the third quarter and still led 55-36 after a three-pointer by Roger Pogoy with 6:13 left in the fourth period. But the Tamaraws only hit two field goals the rest of the way. Mike Tolomia had a chance to win the game for FEU when he was fouled by Ravena with 2.8 seconds left and Ateneo in the penalty. But the Blue Eagles dodged a huge bullet when the FEU star failed to make his two free throws. With FEU down 64-67 in overtime, Tolomia committed another turnover while dishing off a pass to a teammate, leading to a free throw by Ateneo big man Fonzo Gotladera. Tolomia finished with 10 points for the Tamaraws but went just 3-of-16 from the field. Mark Belo led FEU with 16 points while Pogoy added 15. Nico Elorde began Ateneo’s hot start to the extra session with a triple — Ateneo’s first lead in the game, 62-59. Ravena hit two charities and Newsome scored a jumper for a 66-59 lead. Chris Newsome also played big for the Blue Eagles, coming up with 13 points and 16 rebounds. Ateneo (68) – K. Ravena 23, Newsome 13, Gotladera 9, Pessumal 7, Capacio 6, Babilonia 5, Elorde 3, V. Tolentino 2, A. Tolentino 0, Doliguez 0. 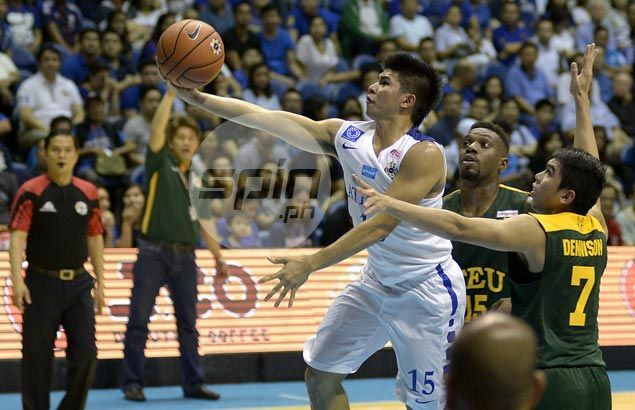 FEU (64) – Belo 16, Pogoy 15, Tolomia 10, Cruz 8, Hargrove 8, Inigo 3, Jose 2, Dennison 2, Tamsi 0, Lee Yu 0, Denila 0.